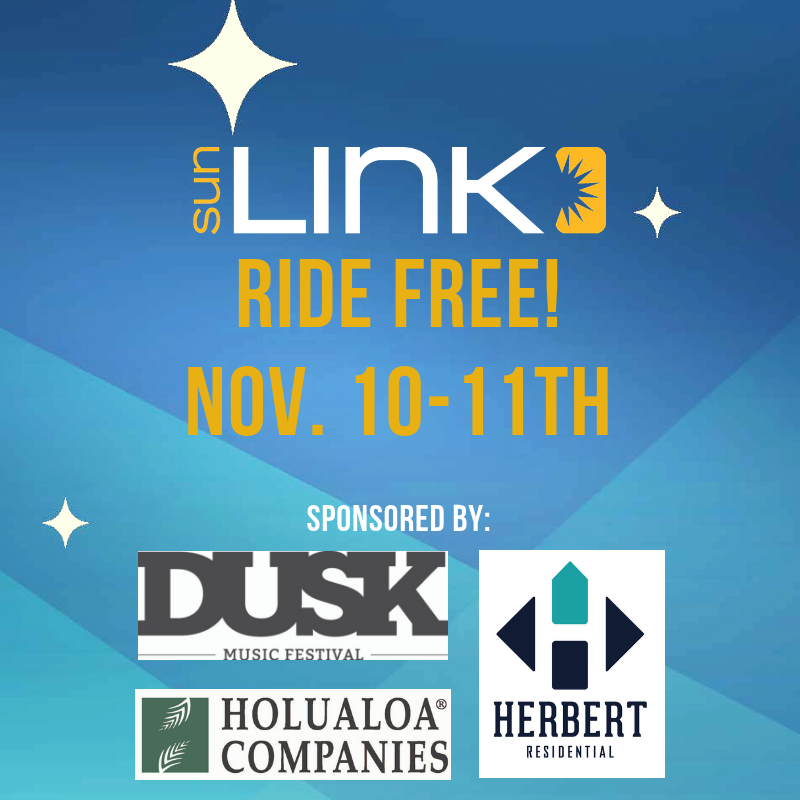 “Streetcar passengers can ride Sun Link for free all weekend on Saturday, November 10th and Sunday, November 11th, sponsored by the DUSK Music Festival, Holualoa Companies andHerbert Residential. The DUSK Music Festival is an annual music and arts festival in Tucson. This year, DUSK Music Festival will be held at Armory Park in Downtown Tucson on November 10-11th. Carolyn’s note: Nov. 11 is also the date for 2nd Saturdays Downtown, so this will be great for those attendees as well. It was standing room only when Sun Link was free on October 13 for Tucson Meet Yourself, 2nd Saturday Downtown, Tenwest, etc. Lots of folks riding Sun Link free tonight. We took it from UA to downtown to the Tu Nidito art show at 260 E. Congress St., then checked out the many booths & music of 2nd Saturday Downtown, then ate dinner at Urban Pita near Plaza Centro. On the way back we went to the 33rd anniversary celebration of Tucson Clean & Beautiful at Crooked Tooth Brewery, and also saw the El Dia de los Muertos art show at Raices Taller gallery (missed the opening last Friday). Great to have Sun Link streetcar free today and tomorrow. Thanks to the donors.